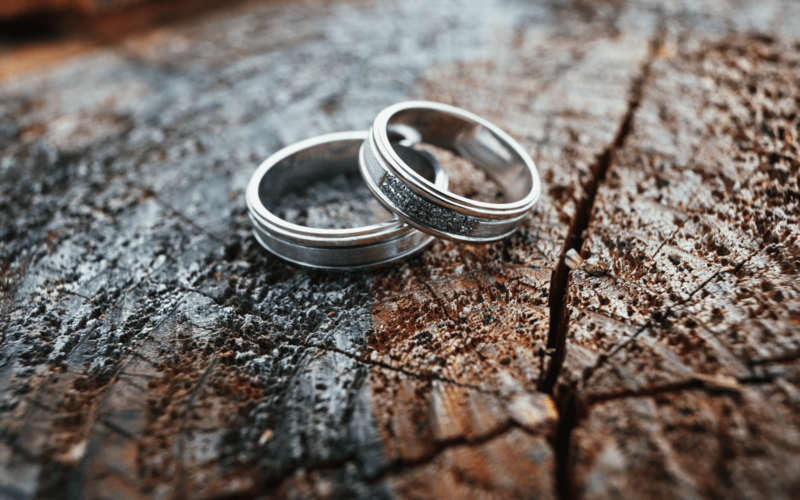 Considering that the wedding band will be a lifelong companion for most men, you need to take care of aspects like the choice of metal, the width, fit, detailing, engraving, and finish to have a wedding band that you will treasure for the rest of your life. Traditionally men’s wedding bands have been crafted from yellow gold, however, in recent times, there has been a lot of interest in variants like white gold and rose gold, as well as, technologically-advanced engineering metals like platinum, titanium, palladium, and even tungsten and cobalt. Tungsten is the new kid on the block and fast finding acceptance due to its sophisticated black sheen and extreme durability. Wedding bands come in different widths and you need to choose one with which you are comfortable. The best way of doing this is to walk across to the nearest retail store and try out rings of different widths. The wider the ring, the more expensive it is, but you get the opportunity of embellishing it more with finishing, engraving, and detailing. The choice of the metal dictates the ring’s cost for a particular width but you can use a metal that’s cheaper to control your costs. Learn more about metal options by visiting this website. Whether the ring feels comfortable or not depends substantially on how good the fit is. You can have rings where the edges are gently curved or flat with sharp edges. Generally, men have tended to favor wedding bands with curved edges as they are more comfortable, however, the design may require you to pick one with flat edges. Again, the best way of deciding is to try a number of rings of the same size with different fits. Finish refers to the different ways in which the ring’s metal can be given textures. You can opt for high polish, which lends the surface of the ring a very glossy look. This is the most traditional and popular. The matte finish is less reflective and preferred by those who want a contemporary understated look. You can even choose a combination wedding band that features both high polish and matte finishes. For a unique look, you can ask for a hammered texture that looks like as if the ring has been pounded repeatedly with a small hammer to create tiny indentations. The addition of accents in the form of gemstones in traditional or contemporary motifs can take men’s wedding bands to a new level altogether. You can also choose to personalize your wedding band with the engraving of your choice ranging from floral designs to your fiancé’s name or other words that have great personal significance. The engraving can be done on the outside or inside or even both sides of the ring. The wedding band is a reflection of your personality and creativity besides being a symbol of your love. Taking time out to reflect on exactly what you want can mean a world of difference in the way the band looks and feels on your finger. Jennifer Fowler is the sales manager of a reputed chain of jewelry stores. Passionate about jewelry, she has written a number of insightful guides on choosing appropriate jewelry. Read some of her recent articles onthis website. How can I dress more fashionable?